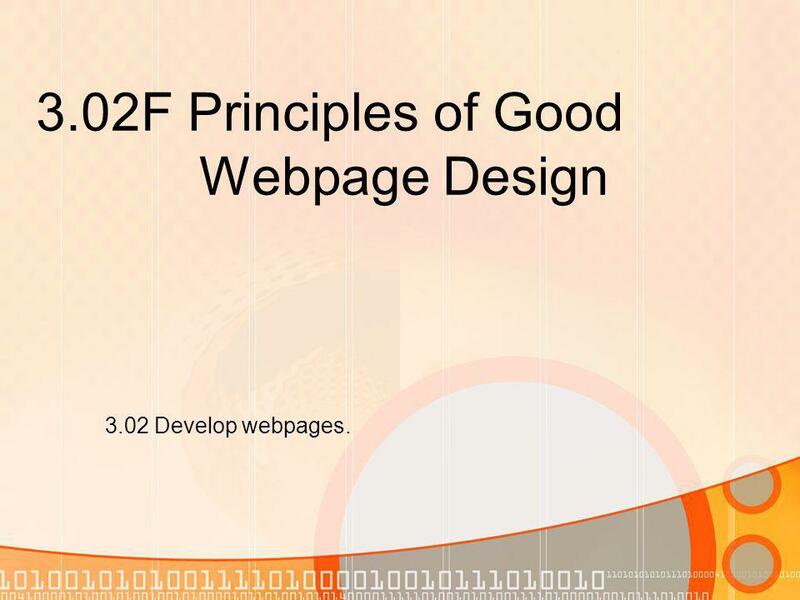 3.02F Principles of Good Webpage Design 3.02 Develop webpages. 1 3.02F Principles of Good Webpage Design 3.02 Develop webpages. 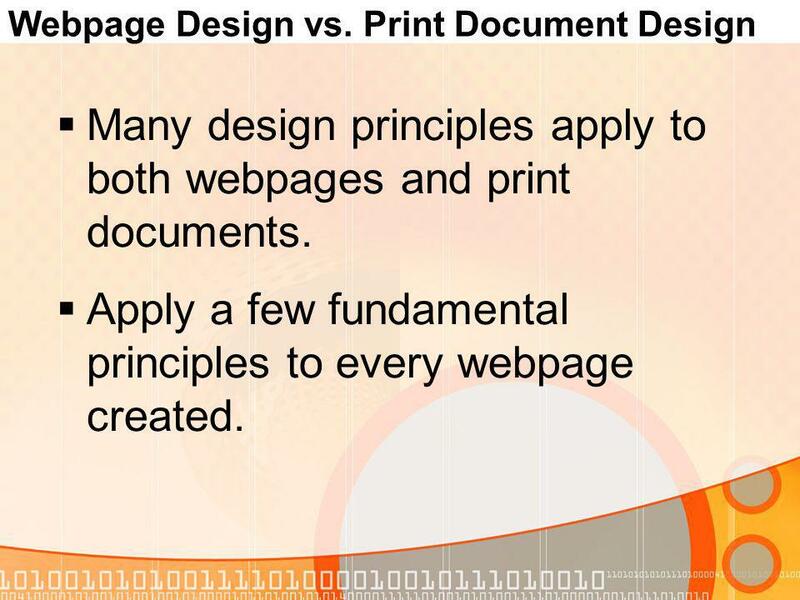 2 Webpage Design vs. Print Document Design Many design principles apply to both webpages and print documents. Apply a few fundamental principles to every webpage created. 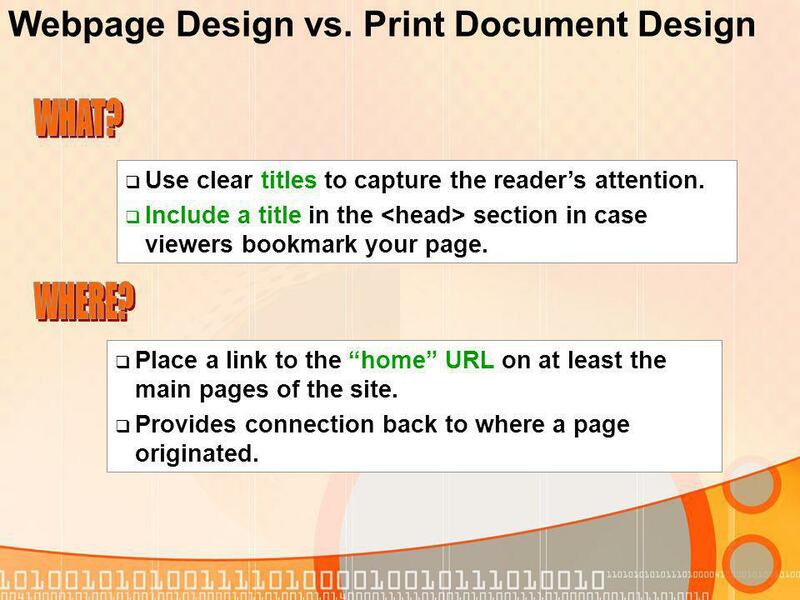 3 Webpage Design vs. Print Document Design Use clear titles to capture the readers attention. Include a title in the section in case viewers bookmark your page. Place a link to the home URL on at least the main pages of the site. Provides connection back to where a page originated. 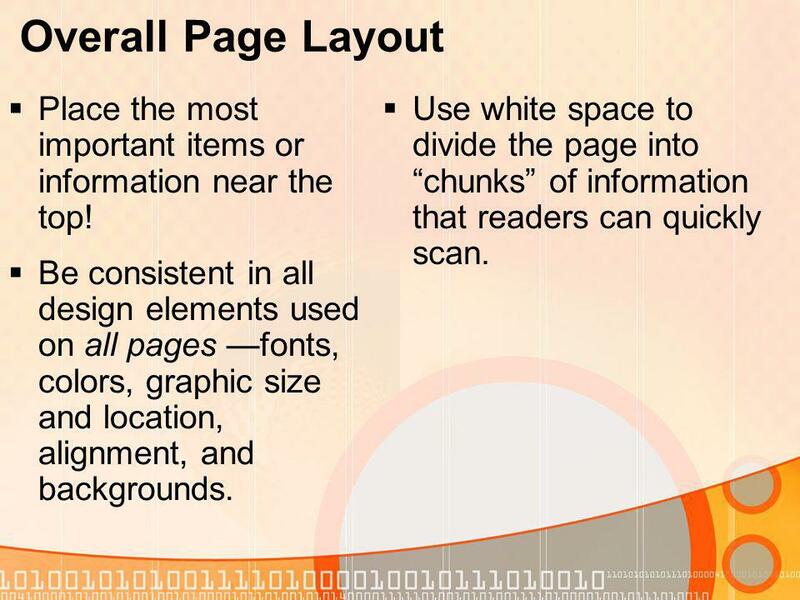 4 Overall Page Layout Place the most important items or information near the top! Be consistent in all design elements used on all pages fonts, colors, graphic size and location, alignment, and backgrounds. Use white space to divide the page into chunks of information that readers can quickly scan. 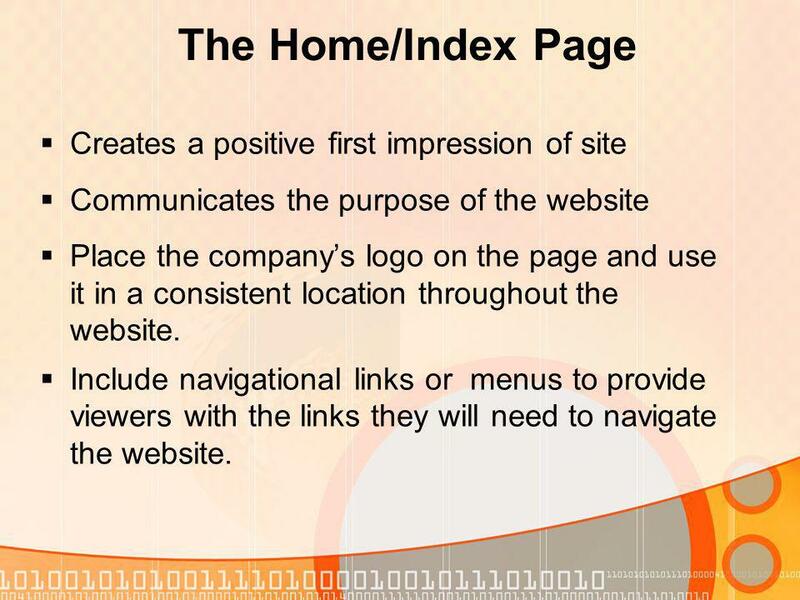 5 The Home/Index Page Creates a positive first impression of site Communicates the purpose of the website Place the companys logo on the page and use it in a consistent location throughout the website. Include navigational links or menus to provide viewers with the links they will need to navigate the website. 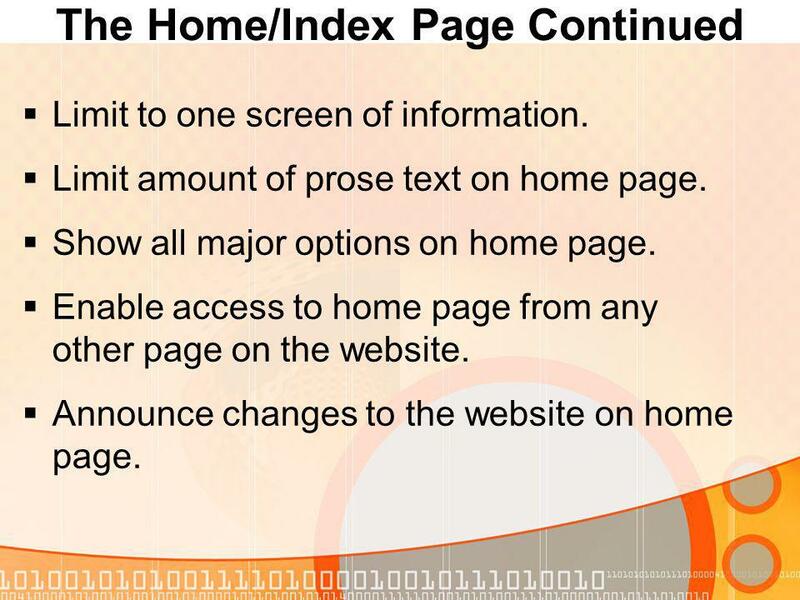 6 The Home/Index Page Continued Limit to one screen of information. Limit amount of prose text on home page. Show all major options on home page. Enable access to home page from any other page on the website. Announce changes to the website on home page. 9 Text IssuesTypefaces Use typefaces designed for on-screen viewing Sans serif typefaces are easier to read on computer screens. 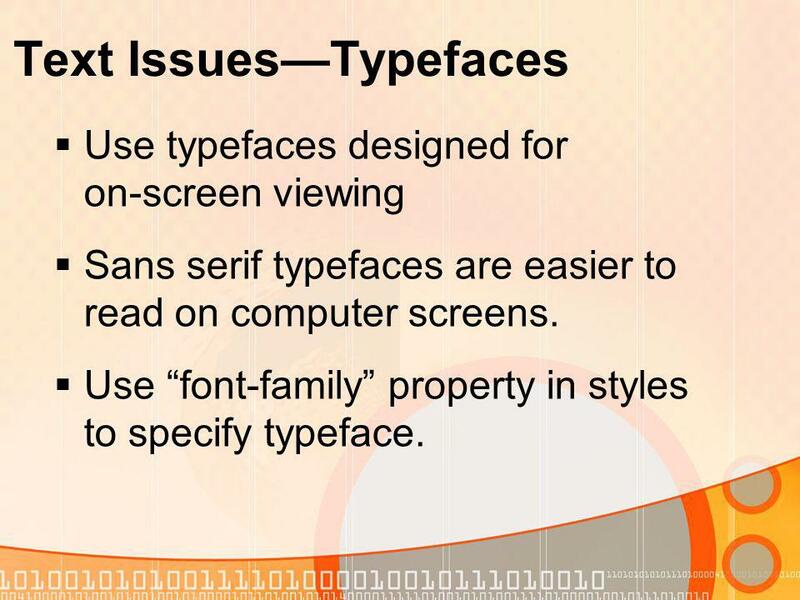 Use font-family property in styles to specify typeface. 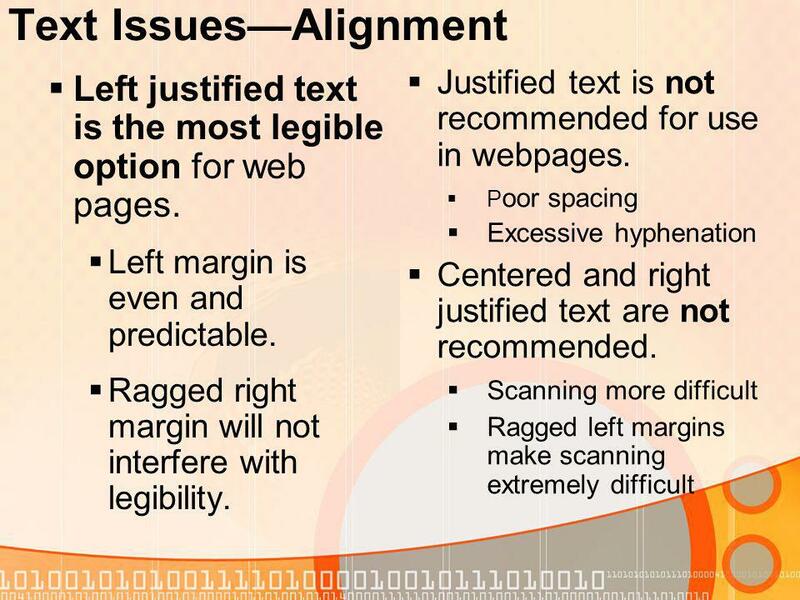 10 Text Issues–Size Display resolutions and operating systems vary. 12 point on one machine may display as 14 point on another. 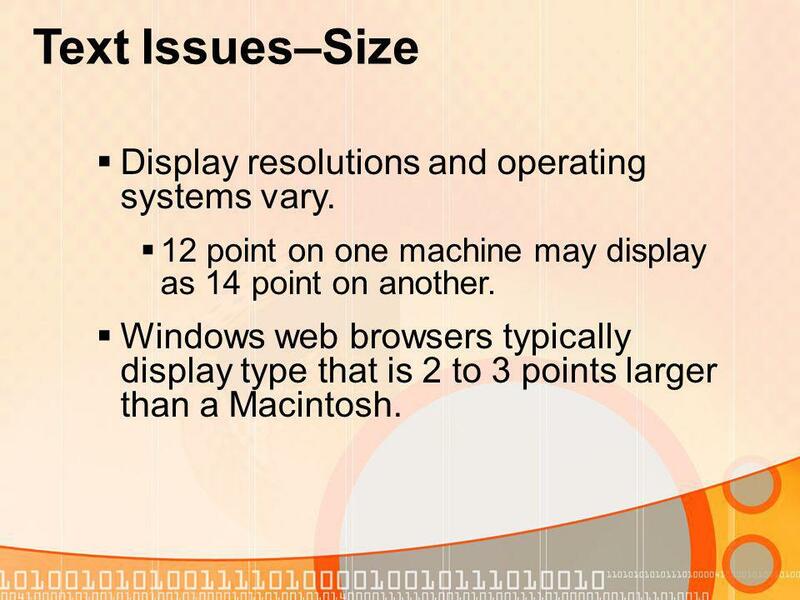 Windows web browsers typically display type that is 2 to 3 points larger than a Macintosh. 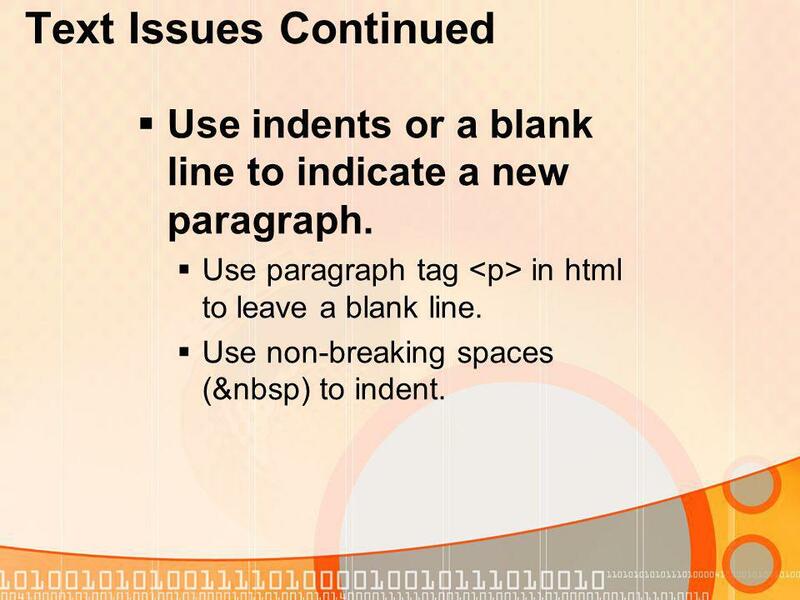 12 Text Issues Continued Use indents or a blank line to indicate a new paragraph. Use paragraph tag in html to leave a blank line. Use non-breaking spaces (&nbsp) to indent. 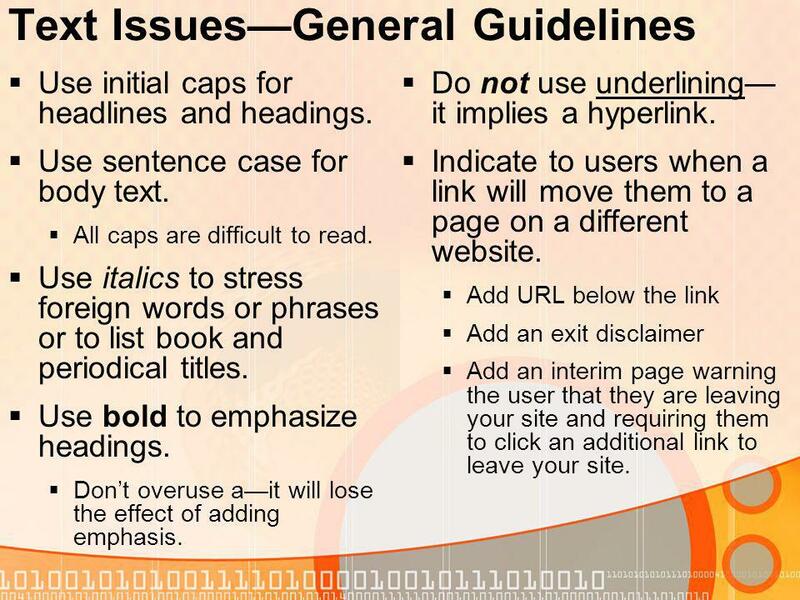 13 Text IssuesGeneral Guidelines Use initial caps for headlines and headings. Use sentence case for body text. All caps are difficult to read. Use italics to stress foreign words or phrases or to list book and periodical titles. Use bold to emphasize headings. 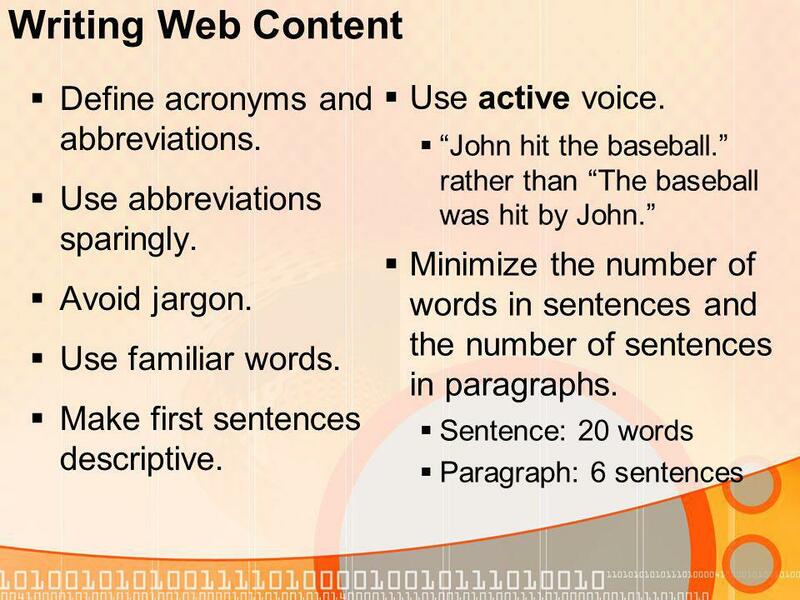 Dont overuse ait will lose the effect of adding emphasis. Do not use underlining it implies a hyperlink. Indicate to users when a link will move them to a page on a different website. Add URL below the link Add an exit disclaimer Add an interim page warning the user that they are leaving your site and requiring them to click an additional link to leave your site. 14 Text Issues Continued Text as a Graphic Use for banners and navigational graphics. 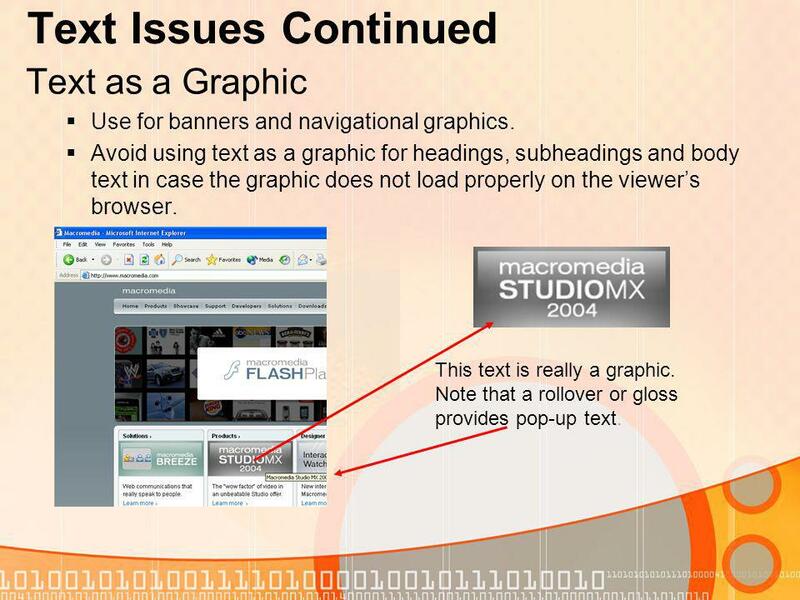 Avoid using text as a graphic for headings, subheadings and body text in case the graphic does not load properly on the viewers browser. This text is really a graphic. Note that a rollover or gloss provides pop-up text. 15 Headings and Titles Use headings that are unique from one another, descriptive and relate to the content they introduce. Use headings in the appropriate HTML order. Helps users get a sense of hierarchy of information on the page Also helps users of assistive technologies understand the level of importance of information Use a descriptive, unique, concise, and meaningful title for each webpage in the website. Titles display in the browsers title bar. Titles are used by search engines to identify pages and are listed on the results page. 16 Lists Display a series of related items in a list. Provide a descriptive heading for the list. Make lists easy to scan and understand Meaningful labels, effective colors, borders, and white space Capitalize first letter and first word in lists. 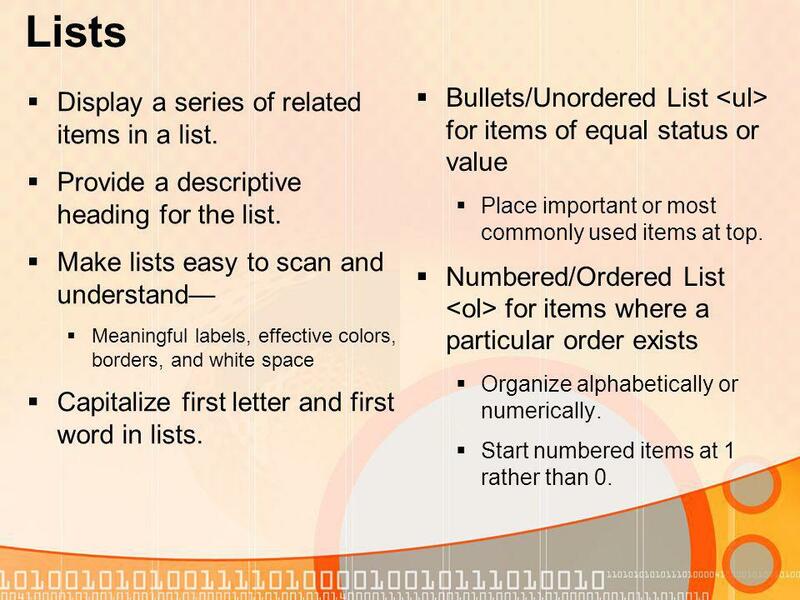 Bullets/Unordered List for items of equal status or value Place important or most commonly used items at top. Numbered/Ordered List for items where a particular order exists Organize alphabetically or numerically. Start numbered items at 1 rather than 0. 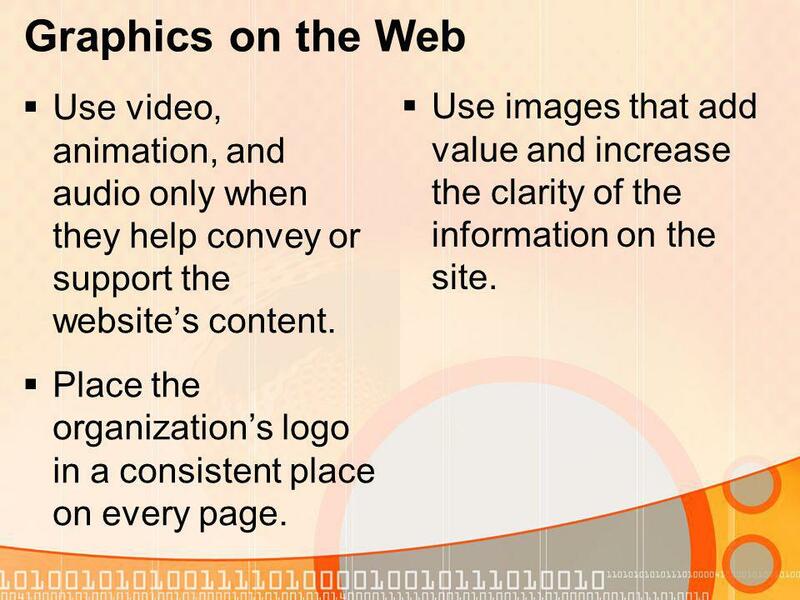 17 Graphics on the Web Use video, animation, and audio only when they help convey or support the websites content. Place the organizations logo in a consistent place on every page. Use images that add value and increase the clarity of the information on the site. 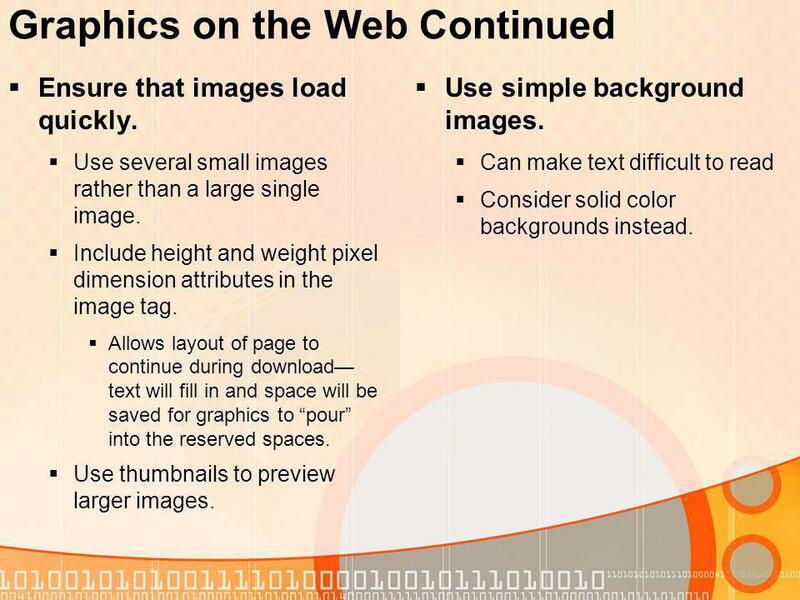 18 Graphics on the Web Continued Ensure that images load quickly. Use several small images rather than a large single image. Include height and weight pixel dimension attributes in the image tag. Allows layout of page to continue during download text will fill in and space will be saved for graphics to pour into the reserved spaces. Use thumbnails to preview larger images. Use simple background images. Can make text difficult to read Consider solid color backgrounds instead. 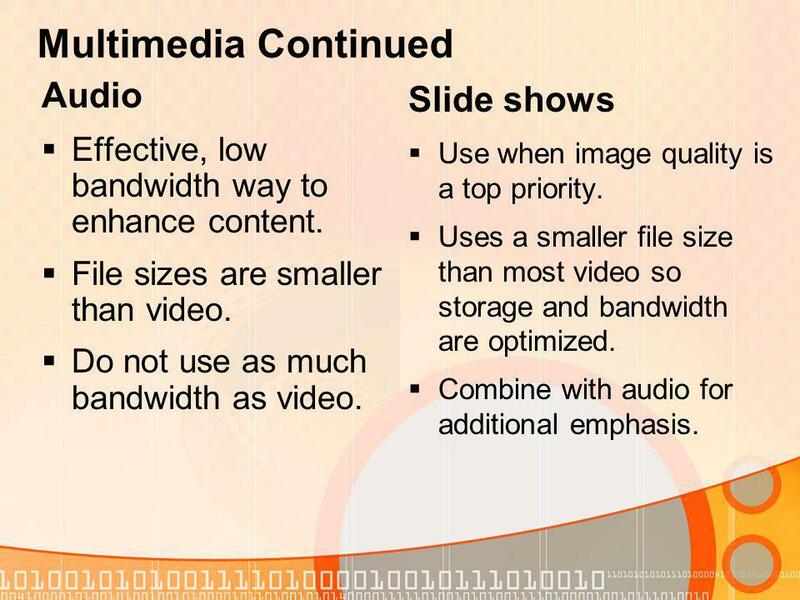 20 Multimedia Continued Audio Effective, low bandwidth way to enhance content. File sizes are smaller than video. Do not use as much bandwidth as video. 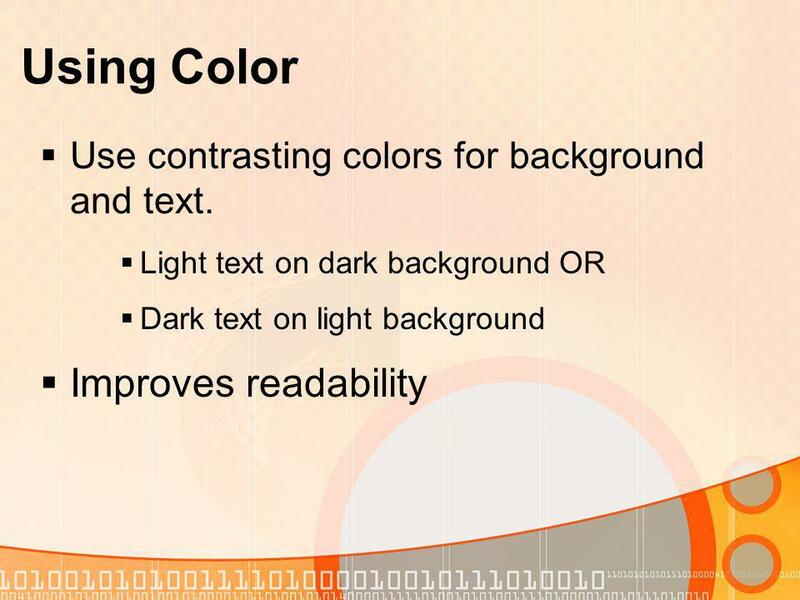 Slide shows Use when image quality is a top priority. Uses a smaller file size than most video so storage and bandwidth are optimized. Combine with audio for additional emphasis. 21 Multimedia Continued Animation GIF format Doesnt require special plug-in Has no interface control. 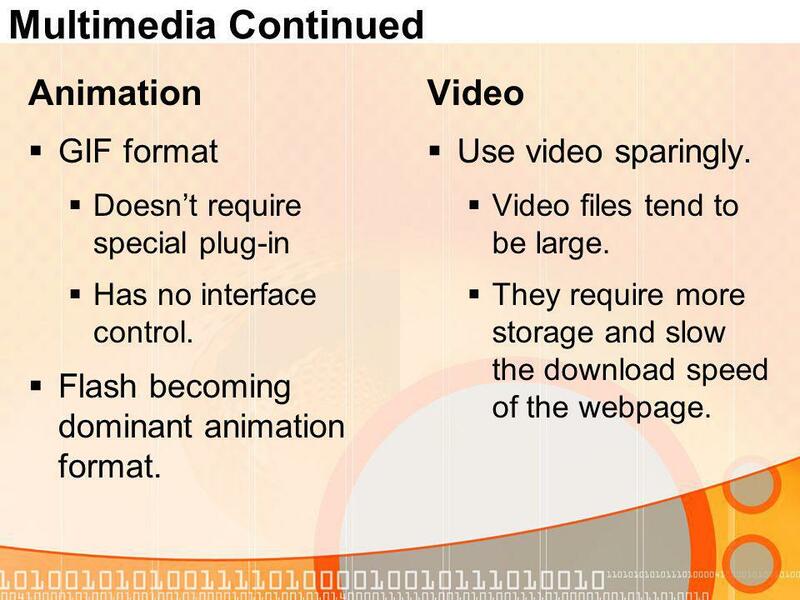 Flash becoming dominant animation format. Video Use video sparingly. Video files tend to be large. They require more storage and slow the download speed of the webpage. 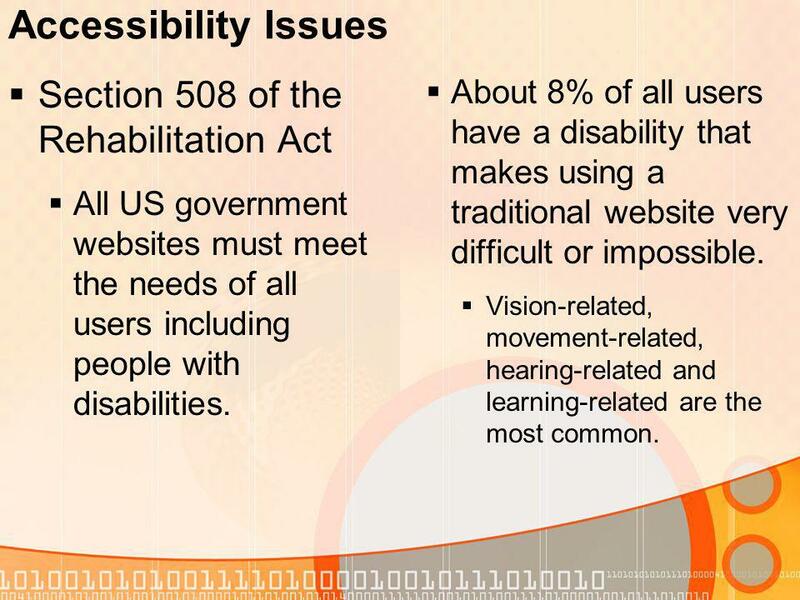 23 Accessibility Issues Section 508 of the Rehabilitation Act All US government websites must meet the needs of all users including people with disabilities. About 8% of all users have a disability that makes using a traditional website very difficult or impossible. Vision-related, movement-related, hearing-related and learning-related are the most common. 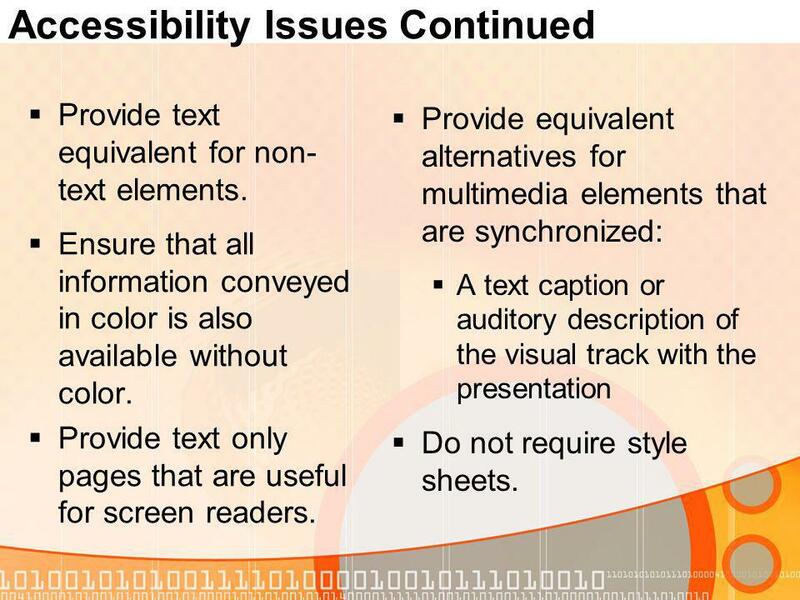 24 Accessibility Issues Continued Provide text equivalent for non- text elements. Ensure that all information conveyed in color is also available without color. Provide text only pages that are useful for screen readers. Provide equivalent alternatives for multimedia elements that are synchronized: A text caption or auditory description of the visual track with the presentation Do not require style sheets. Download ppt "3.02F Principles of Good Webpage Design 3.02 Develop webpages." 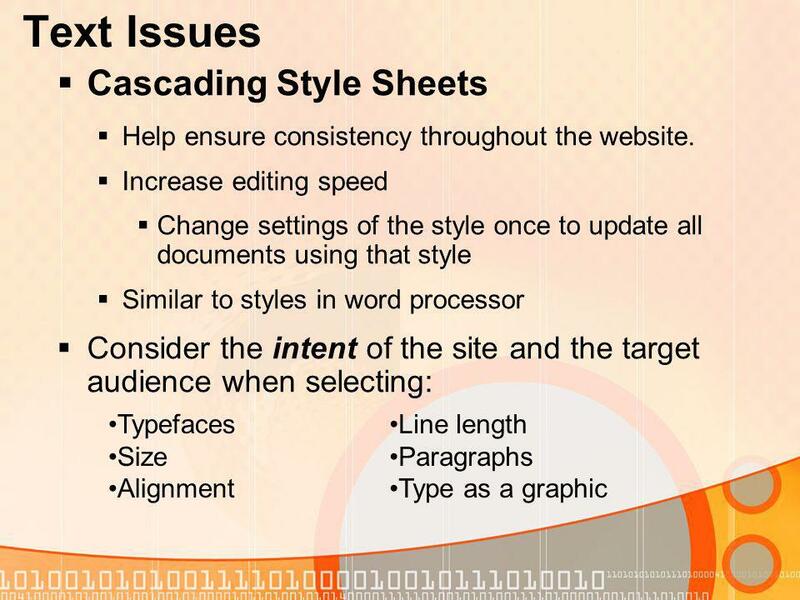 CSS Cascading Style Sheets. Objectives Using Inline Styles Working with Selectors Using Embedded Styles Using an External Style Sheet Applying a Style. Week 7 Web Typography. 2 Understanding Type Design Principles. HTML and Web Page Design Presented by Frank H. Osborne, Ph. D. © 2005 ID 2950 Technology and the Young Child. © 2005 ComputerPREP, Inc. All rights reserved. 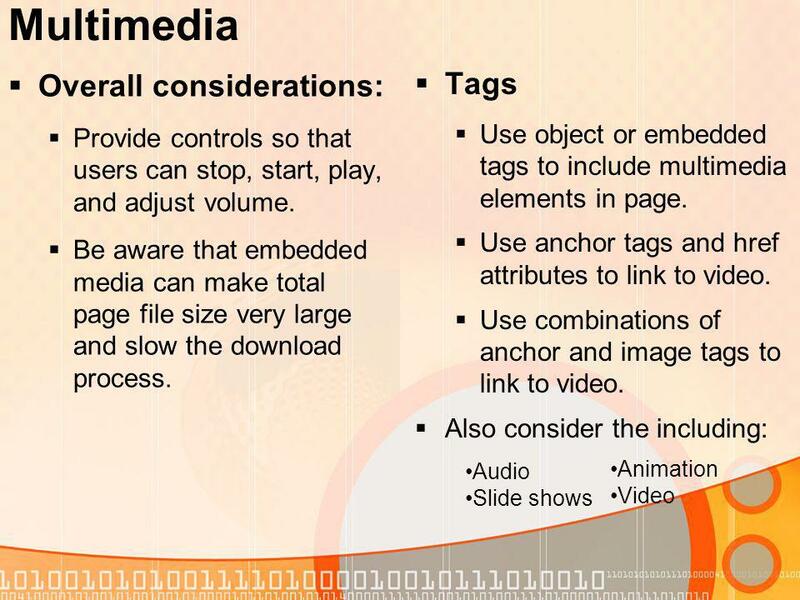 HTML 4.0 and Web Page Design Module I.
HTML Tags. 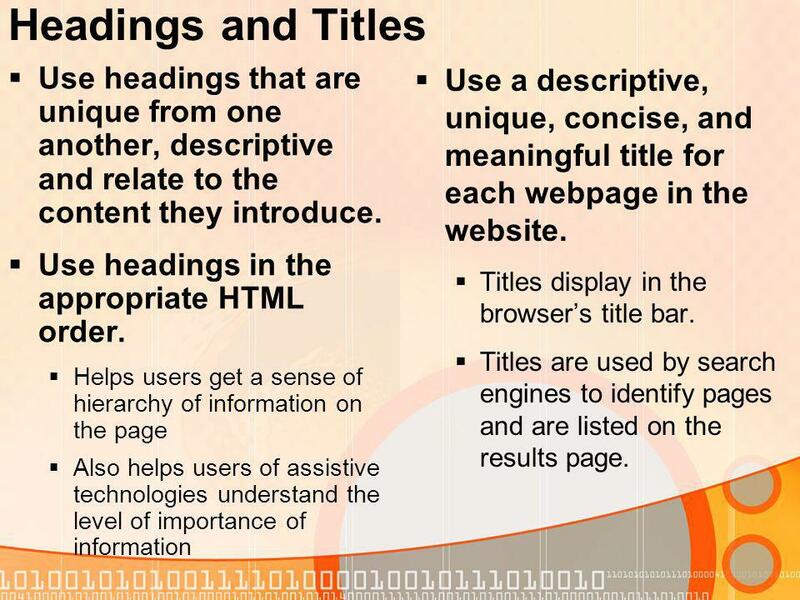 Objectives Know the commonly used HTML tags Create a simple webpage using the HTML tags that will be discussed.